Who said Raw food is Boring? Because I want them to look at this, and tell me this one thing: If I didn’t tell you this was a 100% raw dish, would you have known? So in my second quest for Rawdom, I’m having much more luck so far. After Rawifying (should I start a Raw____ dictionary??) my kitchen, bidding adieu to the microwave, initiating the Dehydrator…I have to say I’m feeling pretty confident! I like to couple my quests with at least one defined goal. The first time I went Raw, my goal was pretty much just survival. Try not to starve. Try to enjoy the process, and make it through the two weeks! This time, I know I can handle those things. In fact, today I knew it would be a long day outside, so I brought the big purse, and stuffed it full of raw trail mix, a couple apples, a date (the best thing for quick energy and focus! ), and a piece of cacao (I take that back–THIS is the best thing for quick, sustained energy!) and a some raw almond butter, spiked with cinnamon. Anyway, this time, the goal is color! It’s summer time afterall, and Raw reigns supreme, especially at this time of year. We have a huge homefield advantage because everything is inherently colorful and bountiful! No effort required. So for breakfast, in my overnight soaked oats, I made sure there were blueberries, strawberries, coconut shreds, gogiberries and hemp seeds. Pretty colorful! Okay, for lunch it was a shake, but before it was the beautiful lime green color, it had LOTS of color! Yellow from the mango, red/orange from the peach, yellow from the pineaple, green from the kiwi and greens…yum! And then you can see the lovely concoction that was dinner. 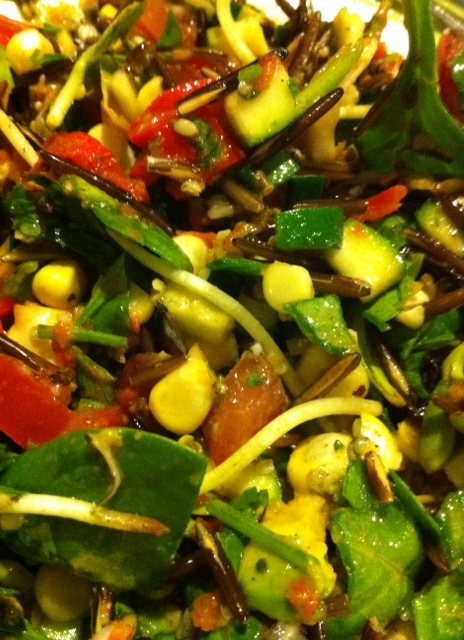 Wild Rice: Soak for 2 days, rinsing 4 times…perfecto! Top with a bunch of cilantro, a handful of raisins, and some pumpkin seeds. ENJOY!